Pressed pork (called Chicharrón Prensado in Spanish) is one of those Mexican foods that can easily be made at home, even though many people might not realize it. 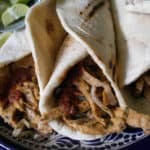 I found out how to make it by accident one-day several years ago, when, after making carnitas, I decided to store the leftovers using my vacuum sealing machine. I just placed the pieces of the tender, golden meat along with the fat drippings inside the plastic bag and didn’t think about it for about 3 days, until I decided to bring it out of the fridge in order to cook it with salsa verde. When I opened the bag I was surprised to see that it actually resembled the look of the pressed pork, and once I tried it, it hit me! It all made sense, that’s why it is called pressed pork! In Mexico, chicharron prensado is sold by the pound at municipal markets, butcher shops, and chain supermarkets. It usually has a round shape and sometimes is really big. It is made out of leftover pork cracklings, which are sometimes fried again before being pressed down to remove the excess fat. There is also an adobado pressed pork version; if you would like to try to make it adobado, add half a cup of the adobo salsa (you can find the recipe on the blog) to the meat, and mix well prior to pressing the pork carnitas. Chop the meat into 1-in pieces and place in a plastic bag, season with salt if needed, or wrap the meat with a cheesecloth very tightly. Using a rubber band, kitchen twine, or a twist tie, tie the bag or cheesecloth close. Press the bag into a saucepan or glass pan to give it the cylindrical shape. Make sure the meat is pressed down tightly. Place a plate over it and top with a heavy object to apply pressure. Leave the meat to compress overnight, and then remove the bag from the saucepan and refrigerate. Now, they are ready to be enjoyed cooked with green salsa, guajillo salsa, and the like, or even stuffed in some gorditas. Pressed pork (called Chicharrón Prensado in Spanish) is one of those Mexican foods that can easily be made at home, even though many people might not realize it. 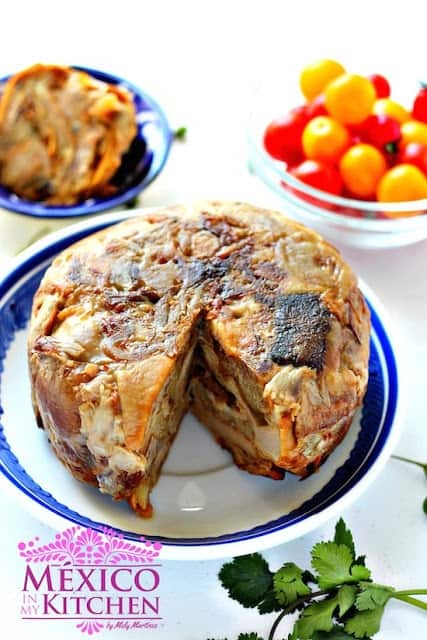 I found out how to make it by accident one-day several years ago, when, after making carnitas. Chop the meat into 1-in pieces and place in a plastic bag, season with salt if needed (carnitas are already salted), or wrap the meat with a cheesecloth very tightly. Place a plate over it and top with a heavy object to apply pressure (cans of soup work great for this purpose). This recipe makes 2 lbs. This preparation needs 24hrs of resting period. If you live in an area with a large Latino population, chances are the local latin stores sell pork carnitas during the weekends. You can also use the store bought carnitas to prepare this recipe. You can also use cheesecloth to form and wrap the meat, that way it will drip more of the fat.